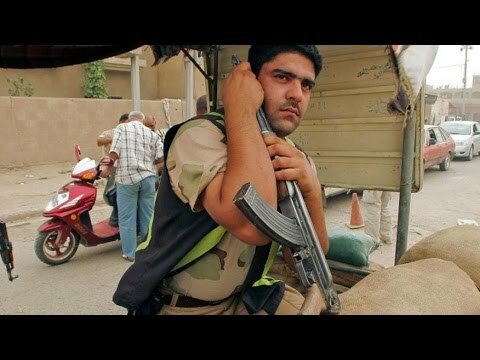 Iraq: Are Sunni Arabs of Kirkuk Province Turning on ISIL? Sunni Muslim extremists continue to kidnap, execute and otherwise impose their authoritarian rule on locals in the areas they control, such as in southwestern Kirkuk. Slowly but surely though, local resistance against them is growing. Tribal leaders suggest an organized, salaried force is in development. On the 12th day after the Sunni Muslim extremist group known as the Islamic State, or IS, took control of southwestern parts of the province of Kirkuk, some of their fighters paid a visit to the house of a local tribal leader. IS group fighters looted and destroyed the home of Sheikh Anwar al-Assi in the village of Arumel, south west of Kirkuk city. They did so because the sheikh had refused to swear allegiance to them. The attack came despite the fact that al-Assi heads the Abid tribe in the area and that this tribe is one of the major Arab tribes here, and also has members in other parts of Iraq. Al-Assi then left his village and went to Sulaymaniyah, inside the semi-autonomous region of Iraqi Kurdistan, which is controlled by the Iraqi Kurdish military – he had word that next the IS group planned to kill him. This kind of behaviour is starting to get stronger reactions from local people. Currently the IS group control the centre of the Hawija district as well as five other Kirkuk neighbourhoods. On June 31, IS fighters killed a woman in the Zab neighbourhood in Hawija because they said she had insulted the IS group. The woman was a housewife and had a son who used to serve in the Sunni Muslim militia known as the Awakening or Sahwa forces, that fought against Al Qaeda; her husband died in 2007. For example, on Sept. 4, one of the IS group’s distinctive black flags was set alight by an unknown person in an abandoned lot near Tal Ali village in western Kirkuk. After this a large number of IS fighters stormed the village and kidnapped 50 of the local men. Thankfully after two days, all of the men were released again. And on Sept. 12, three tribal leaders from a clan that was part of the Abid tribe were killed by the IS group; they also kidnapped 20 people from within the Rashad district. The locals were kidnapped because the IS fighters said they were conspiring to form a militia to expel the IS group from their areas. Many locals are also fleeing the hell that is IS,” Askari added. A source inside Kirkuk’s military says that they also have information from locals who feel they were manipulated by the IS group but who have now realized that IS fighters are committing violent acts and behaving badly. Many of these locals have also fled their homes. There is also communication between the central government in Baghdad and the heads of tribes in Kirkuk about the formation of a properly organized armed force to fight the IS group in Kirkuk. Al-Assi confirmed this, adding that the decision to form such a force is now pending government approval. But, he said, the approval should be sped up. “The delay in liberating these areas from the IS group is a continuous source of misery for the people who have to live under them, live with their mercy, their policies and their mistreatment,” al-Assi said. Al-Assi outlines the plans for the formation of organised troops. The training, payment, arming and administration of any such force would be the responsibility of Baghdad. The tribes’ role will be to supply the troops with “trusted and honest” forces and to help them avoid infiltration by “armed groups or individuals acting in bad faith”. Despite all of this though there have not apparently been any real, organized efforts against the IS group in Hawija yet. People are upset with them, says one local inside Hawija contacted by NIQASH, who could not be named for security reasons, but up until now, most acts of resistance have been limited and individual. “There are rumours about tribal leaders setting up forces to fight the IS group but there is no organized resistance yet,” the local said. Most organized resistance by locals against the IS group seems to be happening in the Ninawa province at the moment, where the IS stronghold, the city of Mosul, is also located.